By including the optional WWAN/4G modem in the Delphin Expert Logger, Expert Transient or Expert Vibro devices, you can enable your system to use GPS by simply attaching an additional GPS antenna. You then get NTP (Network Time Protocol) time synchronization while also receiving GPS positional information. This enables a wide range of data acquisition applications. Time synchronization means that times can be received and synchronized via satellite signal/GPS. A correct time-stamp is therefore always available, even in the event of the device operating in stand-alone mode without any network connection. An additional driver (for the NMEA protocol) means that your Delphin device can also acquire and evaluate positional and speed information. 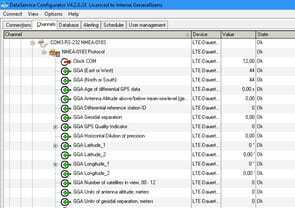 The relevant GPS data is available as a specific channel. The optimal interaction between the WWAN/4G and GPS receiver make Delphin Expert devices ideal data loggers for mobile applications. Thanks to this capability, GPS data along with measurement data can be recorded together and evaluated. Additionally, data such as Temperature, Speed and Engine Power can all be portrayed in Google Earth via conversion into a KML file. Selected measurement data can be merged with the corresponding position marks within Google Earth and color-coded. The map undergoes standard optimization to instantly portray the relevant map section showing the measurement data. Start- and end-point marking are automatically generated, along with maximum values. For more information on GPS & Time Synchronization for the Delphin Expert Series, contact a CAS DataLoggers Technical Specialist at (800) 956-4437.